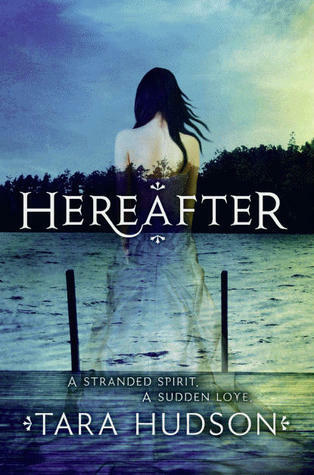 Hereafter is a story about an 18 year old girl named Amelia, who has been wondering the earth for an undetermined amount of time as an unclaimed spirit...ghost. She doesn't remember anything about life prior to her death, but she has recurring nightmares about drowning and eventually wakes up each time in a graveyard. All of this changes the night she meets Joshua. Due to his family history and a life changing event he is able to see and interact with Amelia. Together they are able to unravel the mystery behind the numerous events that have taken place on High Bridge over the years. (This is the site of Amelia's nightmares). He is also able to help her recall who she was in real life. The love story between Joshua and Amelia is very touching, but there always has to be some element of conflict to keep the pages turning. That is where Eli comes in. He is another ghost who attempts to convince Amelia to join him in the after world. He was a very creepy character, but there were some sincere moments when he shared some of his history and helped Amelia discover her abilities as a ghost. I found this to be a very fast and enjoyable read. I was so excited about the story that I convinced Teri to read it because I wanted someone to discuss it with. I was baffled by the fact that she wasn't as enthralled with it as I was. Perhaps I am just a sucker for a good love story. If you are as well, you will not be disappointed. I have read about numerous paranormal relationships, but I can't recall any of them involving an intangible being. This added a unique element that I would have thought was insurmountable, but Tara makes the relationship very believable. This is the first book of a trilogy. The second book, Arise, is scheduled to be released in July of 2012. I am anxious to see how things will unfold for Amelia and Joshua now that they understand the past and can focus on living in the present. I liked the characters in this book. Amelia was not whiny and that says a lot to me. She was determined not to be a bad ghost and fought hard for Joshua. Joshua was sweet and I felt his love for Amelia throughout the book ( tho I still have a problem with how easily the character accepted that she was a ghost.."Oh your a ghost? No biggie..) I even had a few laughs as I imagined how he must look to passerby's as he carried on with Amelia considering no one else could see her. BUT Tara Hudson did a good job of making him do actions to advert this, such as opening the car door for her and acting like he was digging for something in the floorboard as she slipped out. Eli...OK...I will admit it I liked Eli. Oh, not in the swoony like way of Joshua, but lets face it he added some creepiness to this book and I kinda felt sorry for him. I know his job was to bring souls over, but bless him I think he was truly lonely and wanted Amelia as company. OK yes..I did like the book more than I disliked it..I just wish all the action hadn't waited until the last 100 pages of the book! Ghosts, good vs evil, love…..does this not sound like the perfect story. I thought so too when I was reading the back of this jacket of the book. And even though all those things are in the book……it does not set well with me. Let me explain, I love ghost stories and a ghost love story is all the better BUT when I read this book (and I struggled to finish it) I mainly read……blah blah blah. I know that this a bit harsh but I did not like this book at all. Amelia is an 18 year old girl that is dead because of another ghost (bad guy) Eli. Then Amelia saves another boy from drowning, Joshua. Well, Joshua is a “Seer” so he is able to talk, see and fall in love with Amelia. Josh helps Amelia remember a lot about her life and family and Eli shows her how she died (which he helped in that part) and wants her to be his partner to capture more souls. Here is the ending….Good wins, evil is defeated (for the time being) and Joshua and Amelia go on. As much as some of the other BookNerds liked this story I can say this BookNerd did not. I would be interested to see what Tara Hudson writes next……..
Hereafter is a great, haunting book with a love that is forbidden and worth fighting for. Her plot twists were amazing as well as the details going into the book. The places, feelings, and characters you can all feel and see in your head. This is one book you don't want to miss reading!